Pumpkin Spice Everything - The Ultimate List! Is It Already The Pumpkin-Pie-Spice Season? Are you ready for the unofficial season the Internet has dubbed “pumpkin spice everything”? If not, too bad, because it’s already here. We’ve compiled the ultimate list of pumpkin-spice-flavored things, from the natural and logical (like coffee creamer and beer) to absolute abominations (like butter and pet shampoo). Prepare for pumpkin spice and everything nice this fall with our list of 56 unusual pumpkin products. A flavor that reminds people of home, warmth, falling leaves and autumn in general, is now a $361 million business, far outperforming other fall flavors like apple cider. The current fervor is mostly the fault of Starbucks, but the pumpkin pie spice flavor has been around for hundreds of years. But what is in pumpkin pie spice, anyway? It’s just a simple blend of relatively cheap ingredients: cinnamon, clove, nutmeg, and ginger. Rarely do pumpkin-spice-flavored things include pumpkin, though some might use an extract or a small amount of the gourd. While many restaurants, coffee shops, and food companies have their special mixes for the blend, it’s pretty easy to make homemade pumpkin pie spice. From-scratch pumpkin spice might be healthier too, considering that many companies include food dyes and a relatively high amount of either sugar or corn syrup. When does the pumpkin spice latte come out? These days, fall-flavored coffee drinks arrive as early as August. Some argue that it’s far too early, but can we blame companies for trying to take advantage of pumpkin fever? Business booms when they sell pumpkin spice products, and at least they aren’t pushing parents to buy things for Christmas in the summer (yet). On the other hand, there may be a yet-unreached threshold for the consumption of pumpkin spice. Everything in these products is available all year (like nutmeg, used in Christmas sweets, or ginger, used in foods year-round), and the only thing making pumpkin spice products special are their rarity and brevity of availability. In other words, it’s the McRib effect. The concept of fall-fashionable pumpkin spice began with people who want something wholesome, natural, homey, and good for the world. Before Starbucks took over the globe with it, these flavors were more likely to be found at a farmers’ market than a supermarket. But now, things have gotten a bit out of hand. 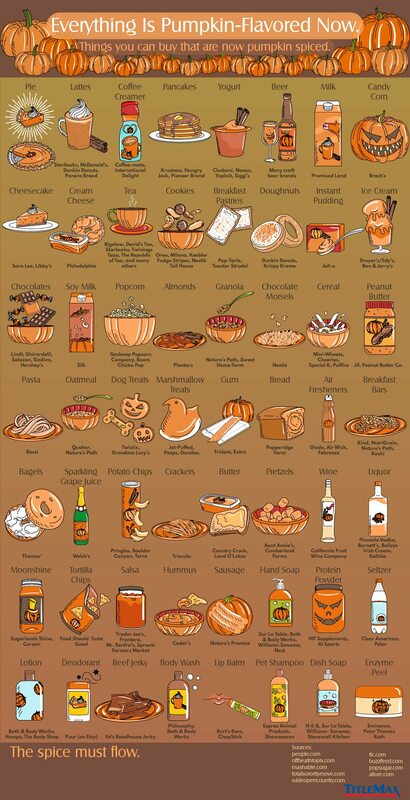 The list of traditional pumpkin-spice-flavored things includes Pringles, Jell-O pudding, Oreos, peanut butter, and, of course, pumpkin spice gum. Even though capitalism has taken full advantage of the flavor to the point where the concept is frequently mocked with more than one famous pumpkin spice meme, customers still experience a “halo of enthusiasm” around pumpkin spice products. Is this a fad that we’re going to look back on in 20 years and scoff at? Or is it still going to be an everyday staple of fall consumption, as it had been for many years before Starbucks produced its PSL? It’s hard to say. Despite the constant mocking of white women in particular (sometimes dubbed “basic”) for consuming the product, the trend continues to keep growing, so many different companies are now stirring the pumpkin-flavored pot. Mocking pumpkin spice is now seemingly as fashionable as consuming it. However, even at the height of its mockery and disdain, the industry grew by 14% in 2013. Perhaps we’ve simply discovered the American version of five-spice powder and will start to see pumpkin pie spice on practically everything all year round.